Providing you the best range of cylinder drying range machine, three bowl padding mangle cylinder drying range machine and textile drying range machine with effective & timely delivery. Three Bowl Padding Mangle Cylinder Drying Range Machine offered is used for penetration of softening agents for knitted fabrics. Softened textile fabrics are smooth. 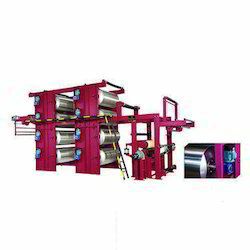 Textile Drying Range Machine for fabrics is treated under the total relax form, on the conveyor belts, with tumbling movements, for achieving the dimensional stability by means of overfeed to obtain length shrinkage, better handle & bulking to the fabric. 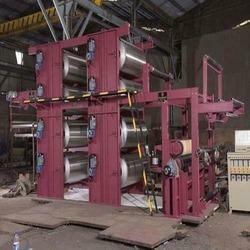 The service life of Drying Machine is long, Designed as per customer requirements, its easy to operate and handle. The dryer is highly energy efficient. It is suitable for various natural and artificial fibers like Cotton, Polyester, Wool, Coir etc and their blends and is equipped with sleepless variable conveyor speed for most efficient drying. Heating is provided through steam, gas, electrically. 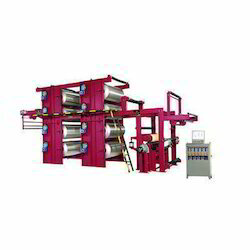 Looking for Drying Range Machine ?